Great opening and page 56. Sounds like a very interesting book. I loved her book ’The Hand That Held Mine. Sounds like a great read. She’s a good author. I love that first line! Here’s my Friday post. Have a lovely weekend! Seventeen brushes with death? That’s a lot! And it sounds like a really interesting look at what it’s like to come that close to dying, Margaret. I think we all think about it, and this memoir sounds like a fascinating reflection on what it’s like to come close to death. That intensely terrifying 56 was enough to make me want to read this book! Wow! Happy weekend! Sounds like an interesting story. I’ve never heard of the author. This week I am featuring a historical mystery – A Dangerous Duet by Karen Odden. Happy reading! That’s a lot of close calls. I’m curious about this book and a new author for me too. 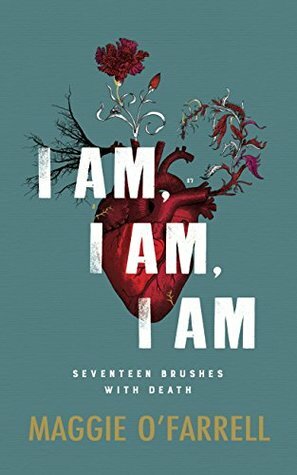 Oh wow, I AM, I AM, I AM sounds like an interesting book. Enjoy your current read! A Memoir about death experiences? How unique is that? I will look for it. My book is called 1968 Do you remember that year?